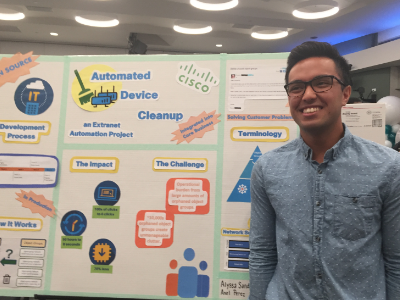 Three Saint Mary's students swept the Cisco Intern Showcase Awards last summer, beating out over 50 other students from across the country and the world. The trio is part of the Accelerated Career Entry Students (ACES) program partnering with Cisco Systems, which currently has eight SMC students participating in a group of 35 interns. For the past two years, SMC has partnered with Cisco through the program, a multi-stage, developmental internship program designed to prepare students from diverse backgrounds for robust career paths immediately upon completing a four-year, undergraduate degree program. In her second year in the ACES program, Claire Rogers ’19 worked with the Continuous Delivery Team, her second time with the team, though some students transfer teams after their first year. “We work to spread the Agile mindset throughout IT,” she said. “Agile is a mindset that originated in software development, but can be applied to all areas of the business and a large variety of projects.” Rogers was able to best communicate the value of her individual project on the Continuous Delivery Team, which won her the award for Best Articulated Business Value. Another second-year intern, Robert Gonzales ’19 (pictured), won the Best Innovation Award, reserved for the most inventive and original project, with a four-intern team. Gonzales was involved in Information Technology, working in programming and coding. In his first year at Cisco, Eli Sylvia-Lourde ‘20 won the Best Pitch Award. He said, “For the Summer Showcase, I created a “Spark Bot” that eliminated inefficiencies in the Cisco Spark workflow. If an individual wanted to create a [chat room] in Spark, they would need to add people to the space individually, which can be very troublesome when adding hundreds of emails [to a room]. My Spark Bot not only has the ability to add people to a room, but can also add entire mailers as well.” Thus, instead of individually adding members to a group chat, his Spark Bot allowed administrators to add entire email lists, streamlining the process. Sylvia-Lourde also co-produced the video which recapped the summer’s activities from the perspective of the interns. On this video, he worked with Tristin Arce ‘19, a second-year intern who was a part of the ACES pilot group. Arce helped create a website to ensure a smooth transition between service platforms within Cisco. He also analyzed and consolidated data to expedite his team’s IT support. The ACES program, which is exploring partnering with new companies in the future, is designed to support students, especially those from underrepresented communities and economic distress, move from entry-level college through mentored internships and graduation to entry-level employment while developing, clarifying, and solidifying personal and professional goals. Interested in more information about applying to the ACES program? Contact Beverly McLean at bam12@stmarys-ca.edu or (925) 631-4793.